The President of India, Shri Pranab Mukherjee inaugurated the Golden Jubilee Celebrations of High Court of Delhi yesterday. 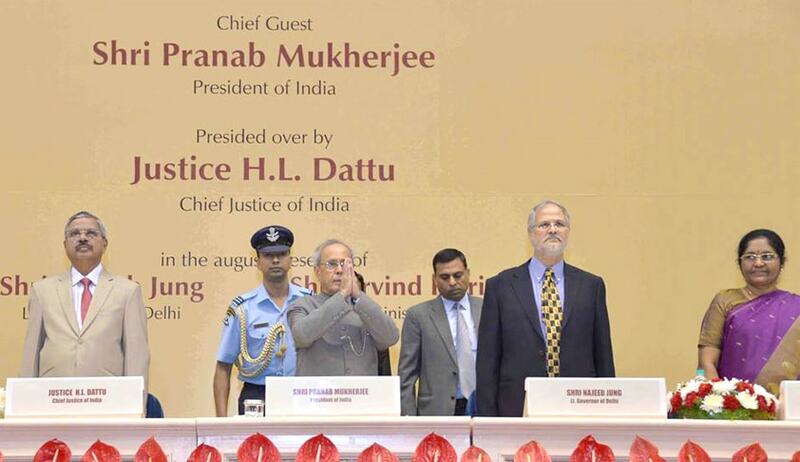 Chief Justice of India H L Dattu, Najeeb Jung, Lt. Governor of Delhi, Arvind Kejriwal, Chief Minister of Delhi and Justice G Rohini, Chief Justice, Delhi High Court were also present in on the occasion. The President also congratulated the Bench and the Bar of Delhi High court and said “ With each passing decade, the Delhi High Court has been served by Judges who have provided intellectual depth, vigour and vitality necessary to create a world-class institution. That this Court has contributed 25 illustrious Judges to the Supreme Court provides eloquent testimony to the high sense of duty prevailing amongst its Judiciary”. He also opined that technology solutions can fasten the process of justice and make it easier for the litigants as well. “Judiciary, which is one of the three important pillars of our democracy, is the final interpreter of the Constitution and laws. It must help maintain social order by swiftly and effectively dealing with those on the wrong side of the law. As an upholder of the Rule of Law and enforcer of the right to liberty, the role of the Judiciary is sacrosanct. The faith and confidence people have in the Judiciary must be always maintained. For justice to have meaning for the people, it must be accessible, affordable and quick”, he said. The High Court of Delhi was established on 31st October, 1966. The High Court of Delhi was established with four Judges. They were Chief Justice K.S.Hegde, Justice I.D.Dua, Justice H.R.Khanna and Justice S.K.Kapur. The sanctioned strength of Judges of this High Court increased from time to time. Presently, the sanctioned strength of Judges of the High Court of Delhi is 29 permanent Judges and 19 Additional Judges.